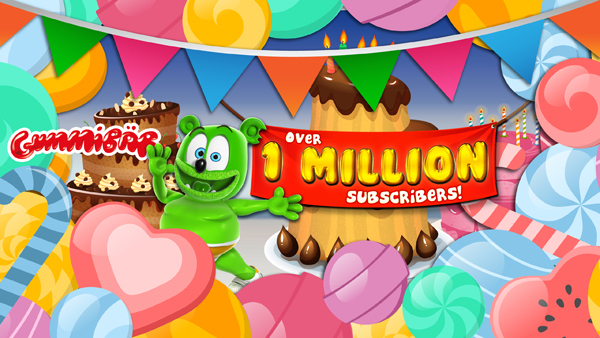 The Official Gummibär YouTube Reaches One Million Subscribers - Gummybear International Inc. The official Gummibär YouTube channel has reached one million subscribers. This is the most tremendous milestone for the cartoon YouTuber to date, as Gummibär had just surpassed 900,000 subscribers this past June. Gummibär’s success began in 2006 with the release of the hit song “I Am a Gummy Bear (The Gummy Bear Song).” “The Gummy Bear Song” is a worldwide phenomenon that has been translated into over a dozen languages with videos for each language, and has lead to multiple albums, a feature-length movie and plush toys sold around the world to adoring Gummibär fans. Following this important milestone, Gummybear International will be releasing Gummibär’s new album Party Pop on Friday, October 16th.